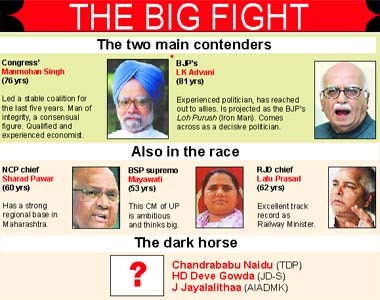 With stakes being so high, campaigning is becoming shriller in the elections to the 15th Lok Sabha with even sober and mature politicians like Prime Minister Manmohan Singh and BJP Prime Ministerial candidate L K Advani attacking each other like never before. Should the government aggressively seek details of Indian account holders in Swiss banks? After kicking up a row over his description of the Congress as an old woman, BJP�s star campaigner and Gujarat Chief Minister Narendra Modi today said he would now call the party �gudiya Congress� instead of a �budhia�. The question in this tribal heartland of Bastar is not who will win this Naxal-affected constituency, it is whether the authorities will be able to pull off the general elections, scheduled here on April 16, peacefully. Three years after his murder, Pramod Mahajan was today a subject matter of a big controversy with his killer-brother Pravin making serious allegations about his character, which Pramod�s family dismissed as a �complete lie� and a �character assassination arising out of a political conspiracy�. Just three days after Orissa DGP said that Naxal threat in the state was �more real and graver� than ever, left-wing extremists today struck with vengeance, launching the most daring attack in recent history on a reputed government undertaking in south-east Orissa. Indian officials say New Delhi is not keen to share with Pakistan any information about threats to Indian leaders from Pakistan-based terrorist groups in the run up to the Lok Sabha elections. The BJP has received support from the most unexpected quarters. People from Pakistan occupied Kashmir (PoK) are using loudspeakers to make appeal to those living on the Indian side of the Line of Control (LoC) to vote for �former Prime Minister Atal Behari Vajpayee's party� as he helped unite separated families on both sides of Kashmir.